The world's cheapest TV, launched in just Rs 3,999. - mobilereview.online - The Ultimate resource for mobile phones reviews, specification, information. Home TV Review The world's cheapest TV, launched in just Rs 3,999. The world's cheapest TV, launched in just Rs 3,999. Last year, during the Indian Mobile Congress 2017 tech brand Detel introduced the DeTel D1 feature phone as the world's cheapest mobile phone. The phone was launched at a price of Rs 299, which surprised all the world tech companies including the Indian market. This company has done a new job again today. After making a name in the mobile market, DeTel has thrown a large dump in the Indian television market today. Detel has launched the world's cheapest television in India today and this TV is priced at just Rs 3,999. The 19-inch D1 TV has been launched from DeTel. This TV is said to be the cheapest TV in the world by the company. Launch of this television by Television is priced at just 3,999. Of course, it sounds strange but it is true that this TV of DeTel is cheaper than a common mobile phone. 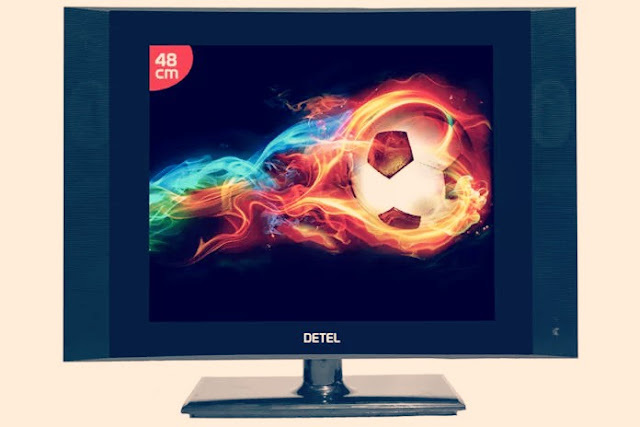 Detel launches this cheap LCD television under the 'Every House TV' campaign. Following the launch of this TV, the aim of the company is to provide television facility to people living in rural and backward areas of the country. Talk about the cheapest television in the world, it has a 19-inch i.e. 48.3 centimeter LCD HDR display which supports 1366 x 768 pixel resolution. This TV has got a plus grade panel which makes the picture quality of the phone the best. The brightness of this TV is more than 200 NITS and Contrast ratio is 300,000: 1. Ditel has also provided an HDMI and a USB port for connectivity in this TV. There is a bezel at the edges of the display television of the Detel TV, which keeps the TV screen safe. There are two speakers also on both side panels. On behalf of the company, there are 12 Watt speakers in the TV which claim Smooth and Clear Video Quality. The price of this TV has been kept at Rs 3,999 from DeTel and the DeTeel 19-inch D1 TV will be available for sale on B2B's base dot com from the first week of December. The company is also offering a 1 year onsite warranty on the purchase of the company.